Thai Son Hotel belongs to Thai Son Hotel System. It is one of the best three stars hotels that located nearly the center of Ha Noi Capital. Conquer the tourists by the ideal position and impress people who stay in by the nice and warm architectural structure also the décor inside. From hotel to Ngoc Son Temple: 0.3km. Total of room: 25 rooms in which there are different room types. 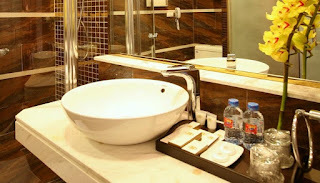 They are superior room, deluxe room, luxury room and suite room. Room features: modern décor, internet in room, mini-bar, tea and coffee free, safety box, hair drier, shower and some other features that offered by the room type specifically.